The RCB has released an updated 2017 Policy on Climate Change and it is much improved over the 2016 version. “the RCB on behalf of the Church of Ireland seeks to mitigate and lower the Climate Change impact within its investment portfolios”. The most galling sentence in the 2016 policy was this one, “the fact is that fossil fuels will continue to contribute a major component of this energy mix for the foreseeable future and remain one of the most cost efficient methods of energy production.” This sentence has also gone. The fact is that renewable energy is already much cheaper than fossil fuels in much of the world. In the new policy the emphasis is on reducing fossil fuel exposure is repeated multiple times in the 2017 policy. This new emphasis is great news. RCB Policy on Climate Change The RCB is supportive of public policy to support a diverse energy mix and a transition to a low carbon economy. As Christians and responsible investors, the RCB on behalf of the Church of Ireland seeks to mitigate and lower the Climate Change impact within its investment portfolios. This video explains why we need to keep fossil fuels in the ground and that we can afford to tackle climate change. The Church of Ireland is divesting from Kinder Morgan (KMI), a fossil fuel pipeline and utilities company. For a number of years KMI was the largest fossil fuel investment the Church of Ireland had with about £4m invested in this company. This is about 2% of its entire investment funds. Kinder Morgan announced last year that it would build another pipeline, the Trans-Mountain pipeline, to treble the throughput of tar sands oils from Alberta Canada to the Canadian west coast. A move that the Anglican churches in Canada oppose. The divestment announcement is wonderful news! I have written a number of times on this blog about the ethical problem of investing in Kinder Morgan. The decision to divest was largely based on financial grounds but this demonstrates that wise investors are divesting from fossil fuels. Bishop Alan of Connor diocese has risen to the top of the environmental league table in the Church of Ireland. His entire Lent Course for 2017 is entitled “Stewards of Creation”. 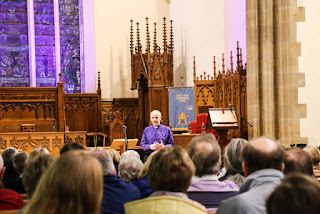 In his talk at Lisburn Cathedral on March 29 he outlined that humans are created by God for a relationship with Him, each other and with the earth and its creatures. We are part of creation but we fail in all of these areas. Hence many of the problems we see around the world.